Arizona Beer Week is upon us once again! With all the fantastic events going on, it is hard to keep track! 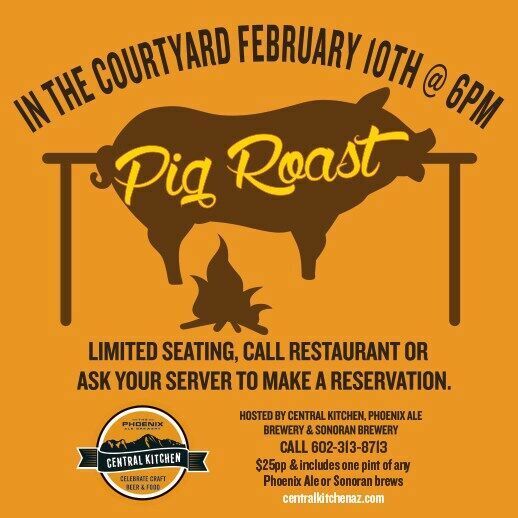 Central Kitchen at 7th St and Bethany Home is hosting a pig roast in the courtyard of The Crown on 7th with Phoenix Ale Brewery (PAB) and Sonoran Brewery in honor of Arizona Beer Week on Friday, Feb. 10th. $25 gets you in to enjoy a full menu, live music and a pint of your favorite Phoenix Ale or Sonoran brew. Pig Roasts are few and far between in the Valley so this is a fun and unique experience that you won’t want to miss! Enjoy spit roasted pig with two sauces, King George Amber baked beans, creamy potato salad, 2 slices of white bread and house made bourbon peach cobbler. Plus your choice of any Phoenix Ale or Sonoran brew all for just $25 (excluding tax and gratuity). Seating is limited so purchase your ticket now at https://www.eventbrite.com/e/phoenix-ale-brewery-central-kitchen-pig-roast-tickets-31604334415 or call 602-313-8713 for further information.